Unlike the last year, 2014 seems promising for the immigration reform legislation. Throughout the last year, the nation went through boundless possibilities of immigration bill passing in house or not. In last February, Mr. Barak Obama promised the nation that this is a perfect time to come out with profound immigration legislation. Gang of Eight from Bipartisan group inscribed a Comprehensive Immigration Reform Bill which was passed in Senate in June, 2013. Comprehensive Immigration Bill consists numbers of immigration issues like Border Security Measures, Path to Citizenship, Merit based Visa system etc. While last year, bill could not bring to vote in house. This year seems an immigration friendly year according to many political analysts and immigration activists. The Conservative Republicans, majority group in House, who always opposed the Comprehensive Bill and suggested to come up few issue based bills rather than one comprehensive bill, likely to support senate bill in 2014. According to political analysts, Republicans may mitigate their firm stand on Immigration Bill this year as more and more GOP members understand the significance of Latino community and they well understand that passing immigration bill is the best way to garner support from Latino voters. According to a Latino Decisions poll, 60% of all who participated in the poll, agreed on the fact that immigration bill is most important issue in Latino community and 70% of all who participated in the poll were dissatisfied with the Republicans stand on immigration bill in the house. Also in 2013, Immigration bill supporters and activists conducted protests and rallies to enforce the house members to consider immigration bill seriously in the house. The FastforFamilies tent, outside the white house forced political leaders to rethink about immigration bill in such a way that Mr. President himself, accompanied with The First Lady, visited the tent and listened protesters. Activists said in the last week of 2013 that we will be back on the roads if immigration bill not passed in the house. The immigration reform activism is deemed as one of the main influential parameter which will oblige house to pass Immigration bill in house at earliest. Comprehensive bill offered path to citizenship which shows a 13 years process for undocumented immigrants to become US Citizens. This was the one critical aspect Republicans opposed firmly and it is believed main constraint of bill which may lead to rejection of immigration bill in house. However, GOP members in house are ready to support legislation which provides legalization to undocumented immigrants over path to citizenship. According to a recent survey conducted by Pew Hispanic Trends Project, 55% of Hispanics are more interested in getting legalization and removal of fear of deportation over a pathway to citizenship. If republicans support this kind of legalization approach, it may possible that democrats will compromise on it rather than pushing for pathway to citizenship. If this happens, it should be considered as magnificent achievement towards immigration reform. Let’s hope that this unsolved issue will get answered in appropriate manner which strengthens our nation’s integrity as well as boost US economy as well. easyIME.com is a free service, which streamlines the immigration medical process for green card aspirants by helping them locate the right USCIS Physician and schedule their Green Card Medical Exam online. Green card aspirants can also find immigration lawyers near their zip code through this service. This entry was posted on January 3, 2014 . 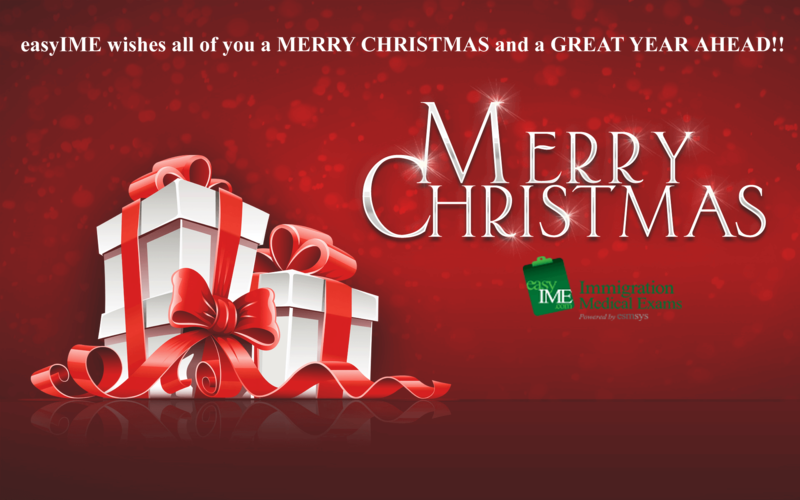 This entry was posted on December 27, 2013 .
easyIME wishes all of you a MERRY CHRISTMAS and a GREAT YEAR AHEAD! May the festival of joy and peace bring happiness to all of us and may the new year ring in growth, prosperity and harmony for the world! We hope that the New Year will see the Immigration Reform Bill getting passed so that it may benefit one and all! This entry was posted on December 24, 2013 . People, who are keeping prickly eyes on immigration reforms news, must know about American President Mr. Barak Obama’s affirmation on Republican approach of piecemeal approach. Last month, Obama said that he is okay if an effective immigration bill, whether in pieces, serves the purpose for the nation. House Republicans proposed few small immigration bills separating each issues rather than one comprehensive bill. However, On Friday, Mr. Barak Obama urged house to support comprehensive bill, constructed by Gang of Eight members. He told that Comprehensive Immigration Bill contain everything which an ideal immigration bill should have. This bill will boost our economy, will generate more high-skilled workers and attract more investment to nation. “So, let’s go ahead and get that done.” Mr. Obama said in year-end conference. Comprehensive bill was passed in Senate in June this year. House Speaker Mr. John Boehner never scheduled the bill for vote in Congress. Most of republicans were against a provision of Path to Citizenship, which proposes 13 years process to appear for Immigration Medical Exam and hence get citizenship to undocumented immigrants. Also, chamber seems more concerned about US-Mexico Border Security than any other immigration issues. Most of the Conservative Republicans in Hose consider the comprehensive bill lighter on Border Security and more lenient on Path to Citizenship. House is now on Christmas holiday break and any further proceedings on immigration bill will only happen in New Year. It will be interesting to see what will happen in this long awaiting, bit dramatic immigration reform legislation which is incredibly critical for millions of immigrants and ultimately for the integrity and security of nation. This entry was posted on December 23, 2013 .